Bishop Feehan&apos;s Marisa Reidemeister won first place in the 200 IM. A four-time All-Scholastic, D’Innocenzo ends her career as the Division 1 Swimmer of the Year. This fall she won the 200 free and 100 breast at the state meet, following wins in the 200 IM and 100 breast at the North sectional. She’s headed west to swim at USC. Bishop Feehan won the Division 2 state title led by this talented junior. Myers won the 200 and 500 free at the state meet, the two events she won at the South sectional. Myers is a US Swimming sectional qualifier and National Honor Society member. Broderick is making her second All-Scholastic appearance after winning the 50 free and 100 back at the Division 1 meet. She owns school records in the 200 free, 100 back, and as part of the 200 medley relay team. She will attend the University of New Hampshire. The junior makes her All-Scholastic debut after winning the 100 free at the Division 1 meet. The week before she won the 100 fly and 50 free at the South sectional. She holds five school records and three South sectional records and is a member of the National Honor Society. Chiulli makes her fourth straight All-Scholastic appearance after winning the Division 2 state championship with a 497-point performance. A Southern Conference All-Star she also finished second at the South sectional meet. The honor roll student will attend the University of Richmond. The school record holder in the 50 free, Daly took the next step in the postseason, winning both the 50 and 100 free at the Division 2 state meet. Daly was also on the state champion 400 free relay team. She was undefeated this fall and will attend Bryant. The junior went from Merrimack Valley All-Conference swimmer to state champion after winning the 500 free at the Division 1 meet. She was also a member of the state champion 200 free relay team. A National Honor Society member, she also runs outdoor track. Korsberg earned Merrimack Valley Conference co-MVP honors with teammate Maggie D’Innocenzo. Att the North sectional Korsberg won the 200 and 500 free. 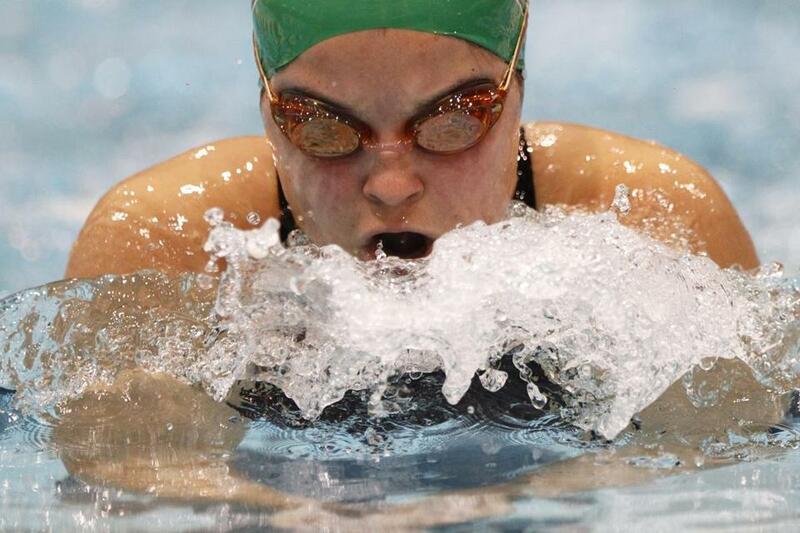 Despite being ill for the state meet, she was on the winning 400 free and 200 medley relay teams. The four-time All-Scholastic will attend Harvard. The Wakefield senior earned All-Scholastic honors after winning the 100 breaststroke at the Division 2 state meet. She was also fifth at states in the 100 butterfly. A Middlesex League All-Star all four years, she’s also a member of the National Honor Society. The talented sophomore makes her second All-Scholastic appearance after leading Bishop Feehan to the Division 2 title. At the state meet she won the 200 IM and was on the 200 medley team that tied Bishop Stang for first place. At the South sectional, she won the 200 IM and 100 breaststroke. Now a two-time All-Scholastic, Sheridan was a double winner at the Division 1 state meet, taking the 200 IM and 10 fly titles. She also was part of the winning 200 free relay team. 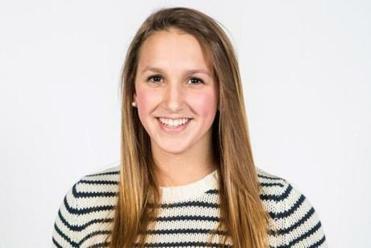 The Merrimack Valley All-Conference swimmer also competes for Crimson Aquatics. After going undefeated this fall during the regular season, the junior diver won the South sectional and Division 1 state titles. She broke Framingham records for both six and 11-dive totals and also took the Bay State Conference dive title. She’s also an all-star gymnast. Chelmsford had the fastest 200 free relay in the state this fall, winning at the North sectional in 1:40.18 and then taking the Division 1 state championship in 1:38.76. Jennifer Day, Caitlin Sheridan, Katherine Su, and Julia Sementelli helped lead the Lions to a second-place team finish at the Division 1 state meet. All four are juniors. Day and Sheridan were individual state champions. Nothing sets the tone for a meet than a win in the opening event, the 200 medley. Andover took first place att both the Northh sectional and Division 1 state meets and went on to win the state championship. Maggie D’Innocenzo, Emma Cammanna, Maeve Awiszus, and Alexa Korsberg swam a 1:49.66 at states, besting second-place A-B by more than two seconds. Andover dominated the 400 free relay in the postseason, winning the North sectional title in 3:35.70 and the Division 1 state title in 3:33.16. The team of Maeve Awiszus, Maggie D’Innocenzo, and sisters Ashlee and Alexa Korsberg was one reason Andover won its 13th state title in the past 14 years. Ashlee Korsberg and D’Innocenzo were individual All-Scholastics as well. Only Awiszus returns next fall. The Colonials had another great season led by Johnson, one of the winningest coaches in state history. A-B was second in the North and third at the Division 1 meet. Johnson has coached the girls for 11 years, the A-B boys for 35. He’s a member of the EMSCA Hall of Fame. In his 18th year, Crosscup led Belmont to one of the school’s best seasons ever. Belmont finished 8-3 and was Middlesex League tri-champions with Reading and Lexington. But there was no tie at the league meet, where Belmont took top honors. Belmont was third at the state meet. Bay State — Framingham: Maura Sticco-Ivins. Merrimack Valley — Andover: Maeve Awiszus, Emma Cammann, Margaret D’Innocenzo, Deborah Daly, Soojin Kim, Ashlee Korsberg. Central Catholic: Jacqueline Russolillo. Chelmsford: Jennifer Day, Caitlin Sheridan, Kat Su. Haverhill: Sarah Broderick. Methuen: Rachelle Gauvin, Kelly Lennon, Cyanna Roig. Middlesex (Freedom) — Burlington: Amber Speck. Melrose: Anna Steele. Stoneham: Kaylie O’Connell. Wakefield: Carianna Gardia, Emily Medeiros, Shannon Quirk. Middlesex (Liberty) — Belmont: Jessie Blake-West, Taylor Coutinho, Thea Kelsey, Maya Nagashima, Ana Pulak, Emily Quinn. Lexington: Fiona Chung, Madison Keohane, Karen Lin, Jayne Vogelzang, Briony Waite, Emily Zitkovisky. Reading: Alexa Bosley, Erin Daly, Kasey Lamb, Ameila Panek, Christina Tzianabos. Winchester: Maddy Nolan. Woburn: Phillippa Zheku. Southern — Apponequet: Makayla Logan. Bishop Feehan: Shelly Lapierre, Madalyn Myers, Hannah Nitso, Katherine Perry, Tayla Piggot, Marisa Reidemeister, Nikki Steiner. Bishop Stang: Olivia Decas, Kaya Flanagan, Sienna Lapalme, Maria Lopez. Brockton: Virginia Burns. Durfee: Caroline Batista. New Bedford: Aubrey Williams. Notre Dame (Hingham): Julie Coen, Sarah Jaklitsch. Seekonk: Kaila Greene. Ursuline: Abby Lake. Westwood: Irina Chiulli, Sammy McDonald.